Lokesh Machines Limited was incorporated on 17th December 1983 and started commercial operations in 1985 at Hyderabad. Presently Lokesh is operating from five locations in Hyderabad and Pune. Lokesh exports CNC machines to Japan, Germany, Netherlands, Italy, Turkey, China and Middle East countries. Lokesh is listed on BSE and NSE. The IPO was issued in 2007. Lokesh is ISO 9001:2008 & TS 16949:2009 certified by TUV Nord. Lokesh provides direct employment to over 750 people and indirect employment to over 2000 people. Lokesh is a leader in Cam & Crank borers, Fine borers & Finish Milling machines. 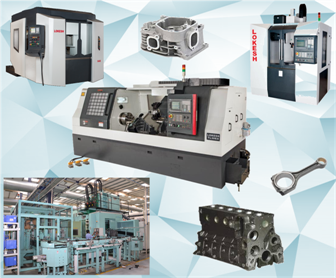 The latest achievement is the supply of a complete range of Special Purpose Machines to machine EURO VI compliant Engine Cylinder Blocks & Heads to M/s Volvo Eicher Commercial Vehicles Ltd.
Lokesh ranks amongst the Top Five Machine Tool Manufacturers in the country.